The sea. The combination of the clear, blue water and endless horizon makes it the ultimate symbol of possibility. And it’s that immensity, that well of opportunity, where we need to focus. 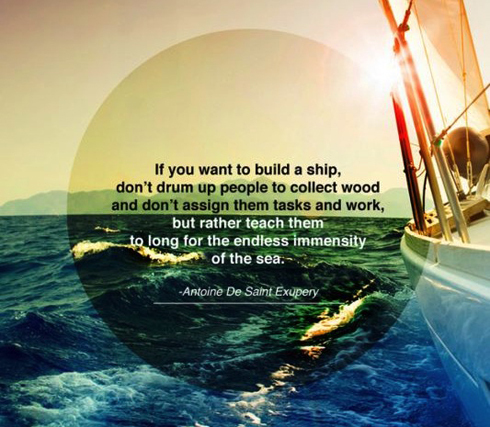 Because to make the new era of business happen, we need the dreamers to start building ships and setting sail. We need to mobilize people around blue-ocean ideas and opportunities. we need to inspire people to believe in something big, something deeper than what we see on the surface. It’s time to build ships and set sail towards a new era. It’s time to put the post-war industrialists and die-hard capitalists in the rearview and build the world that we want. We need to start telling a new story. Despite the array of new marketing tactics and digital strategies, storytelling still remains the simplest and strongest method of connecting people. In the world of business, we don’t need more people who can present powerpoints or put together spreadsheets. We need people who can imagine new horizons and script a story about how to get there. The summer is the perfect time to bask on a chair under the sun and daydream. Let your mind wander to a place of deep possibility and endless horizons. Long for the sea. Let’s set sail and tell a new story. Vamos-lá. Allons-y. Vámonos. Let’s Go!